We are grieving for the 11 Jews slaughtered by a far-right, anti-immigrant, anti-Semitic vigilante as they prayed in the Tree of Life Temple in Pittsburgh on October 27, as well as for the two black people who were murdered in Louisville, Kentucky three days earlier, in what is also likely to have been a hate crime. These attacks came on the heels of the pipe bombs that a loyal member of Trump’s base sent to more than a dozen leading Democrats and opponents of Trump. These vicious attacks are frightening and disheartening but, unfortunately, not shocking or surprising. As the midterm elections approached, Bigot-in-Chief Donald Trump had been feverishly whipping up fear and hatred of the caravan of migrants that is making its way through Mexico to the US, and his incitement directly triggered the massacre in Pittsburgh, as the gunman himself announced on Facebook immediately beforehand. The fact that the gunman also believes that Trump is actually a “globalist” (read: tool of the Jews) in no way absolves Trump of responsibility for inciting mass murder. In addition, the targets of the pipe bombs are all regularly vilified on Fox “News” and the rest of the Trumpite media, including Trump’s Twitter feed. Most of the Jewish community is angry, as well as sad, and it knows that Trump bears responsibility. 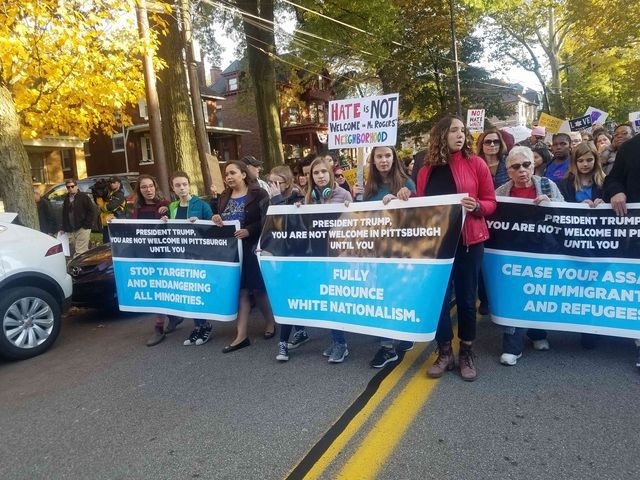 In Pittsburgh, funerals for the victims of the massacre turned into protests of thousands of Jews and non-Jews against the hatred emanating from the White House. There were numerous protests and inter-denominational events elsewhere in the US and around the world as well. My name is Merissa and I am sitting a few rows behind you. I am in Los Angeles because my family lives here. We are Jewish. We survived the Holocaust. My family members were murdered in gas chambers—all of them except 5 that lived. So here I am, on a plane with you. As my father says, we were born with anguish. Our president blamed Saturday’s shooting spree on the synagogue. He said if they had an armed guard it would have been fine. Do you have an armed guard when you pray? God should be safe to convene with, right? A lot of people were upset, angry + scared on the plane when they saw your hat. For you, I want to assume it’s about politics, economics + the support of a charismatic man. I wonder if you mean to scare black people, Jews, + immigrants? To us your hat sanctions our death, our murder, our evisceration. Because your hat supports a man who does little to help us + so much to fuel hatred, violence + cruelty. I love you. I hope your good America doesn’t include flushing me + my people out. Unfortunately, the small minority of the Jewish community that is pro-Trump (about 21%) is still refusing to break with Trumpism and even refusing to admit that he bears responsibility for inciting an anti-Semitic massacre. It sides with Trump because of its hatred of secular society–– support for Trump among Orthodox Jews is about 90%, while much fewer than 10% of non-Orthodox Jews support him––and his positions vis-à-vis Israel.